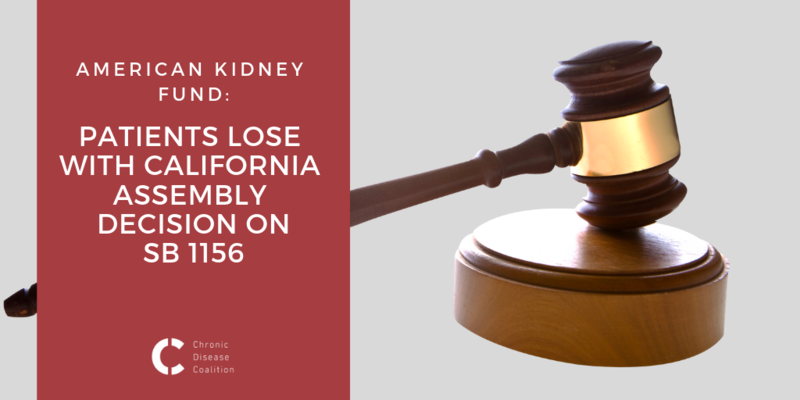 The American Kidney Fund (AKF) released a statement this week regarding the California Legislature’s decision to vote in favor of SB 1156 and put insurer profits before patients’ needs. The Chronic Disease Coalition agrees with this position: Insurance companies should not be given the power to determine whether they cover patients with chronic diseases, with end-stage renal disease, diabetes, lupus or others. SB 1156 threatens low-income kidney patients in California who receive charitable premium assistance to help afford their bills. The bill is a thinly veiled attempt to by insurers to prevent kidney patients from being able to choose their own insurance plan if they accept charitable premium assistance.